El Anatsui, from Ghana, has been a major force in African art for decades. A founding member of the Nsukka Group in Nigeria, he and his fellow artists have promoted contemporary art in West Africa, drawing inspiration from centuries of work by the local Igbo people. Igbo design, or uli, emphasizes, linearity, asymmetry, and lack of perspective. 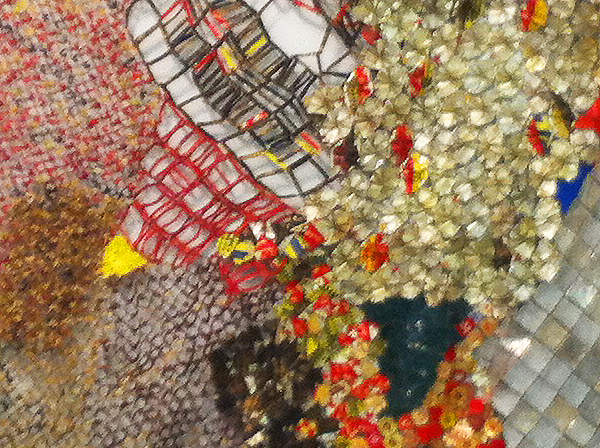 All these features are exemplified in of Anatsui's work. Among the Nsukka artists, he has achieved the greatest international fame, with work in major museum collections, such as the Metropolitan, the British Museum, and the Pompidou. In a recent installation, he covered the facade of the Alte Nationalgalerie in Berlin with a large sheet made from bottle caps and other bendable bits from beverage containers. 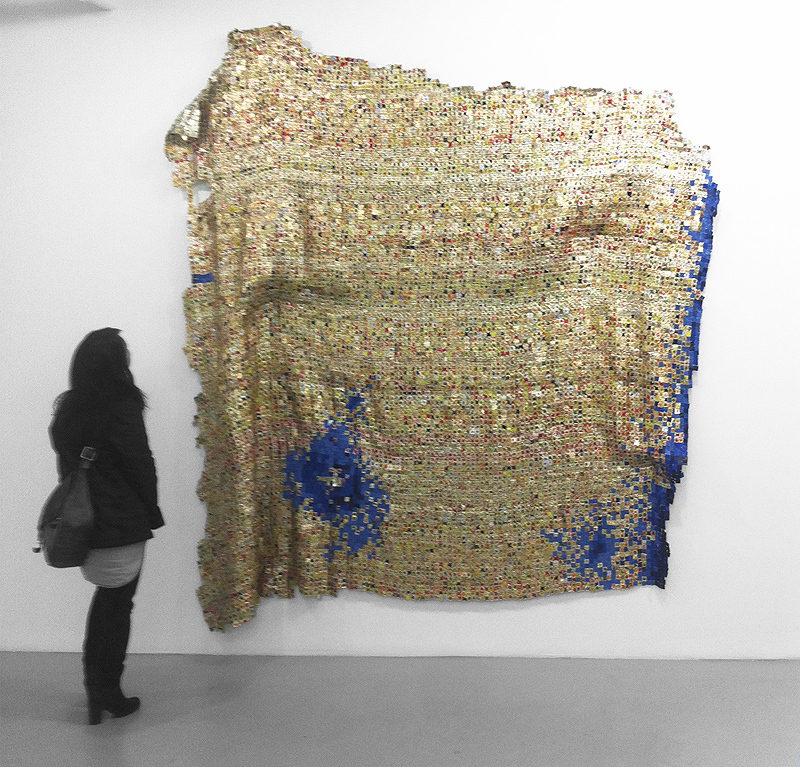 Those luscious metallic sheets are Anatsui's trademark. They have gained fame for their opulent grace as well as their unlikely materials. Making art out of bottle caps is the ultimate alchemy: trash is transformed into gold--which also happens to be the dominant color in Anatsui's palette. In addition to the political messages (poverty, pollution, consumerism, etc. ), we are reminded that everything is a potential art supply. Anatsui is more aesthete than politician. New York is lucky to have an Anatsui exhibition, closing this Sunday (run!) at Jack Shainman, one of my favorite galleries in Chelsea. Full of elegant works, the show is also noteworthy for including pieces that depart from Anatsui's gold palette and sheet-like forms. Some of the the work drips into tendrils or branches out onto the wall. There is even sphere, which unravels like a ball of yarn, as if it were the source material from which Anatsui's metallic textiles flow. Encountering these works up-close in the gallery is a special delight. It allows viewers to see the subtle variations in the artist's technique. One thing that makes this work rewarding is Anatsui's attention to detail. Each piece could be studied for hours, from inches away, without ever getting bored. I end with a few examples. I have problems to understand contemporary art. And this is no exception. I did not understand from your post why Anatsui work is considered artistic. I understand that anything can be an art supply and that it is about consumerism. How many contemporary artists get by with this concept of consumerism? Asymmetry and lack of perspective is something artistic by itself? Someone who is not an artist can be good with these. I need something more specific to define an artistic idea. It is just too general, these ideas can apply to a various number of artists. Just my opinion but I believe his work is artistic because it's friggin beautiful!!! maybe not in your eyes but beauty is in the eye of the beholder, as they say. I love his art - it's intricate, it's evocative, it's mesmerizing, it's gorgeous!